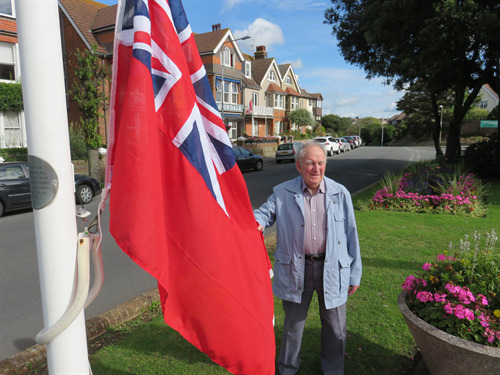 From the 3rd September Merchant Navy Day, Seaford Town Council will be flying the Red Ensign Merchant Navy Flag on the flag pole at the Town’s War Memorial, Sutton Road, for a week to remember those who served and are currently serving. Red Ensign is a flag that originated in the early 17th century as an English Ensign flown by the Royal Navy and later specifically by The British Merchant Navy. The precise date of its first appearance is not known, but documents have indicated that the Navy was paying to have such flags sewn during the 1620s. This tribute has been undertaken at the request from Berry a local Seaford resident Mr Berry, who served in the British Merchant Navy for 32 years between Newhaven and Dieppe. Mr Berry contacted Seaford Town Council to request the Ensign be flown saying ‘If it had not been for The Merchant Navy there may not have been a Battle of Britain Day, because all the fuel the planes needed was imported’. The casualties suffered by the Merchant navy during the War were horrendous, 34,902 were killed, 4,707 were wounded, and 5,720 were taken as prisoners of war’. Seaford Town Council would like to thank Mr. Berry for bringing this important occasion to their attention, it’s flying will now be an annual fixture in the programme of flag flying at the War memorial. For details on any of the Town Councils services, events or meetings please www.seafordtowncouncil.gov.uk, or contact us via phone 01323 894870 or email admin@seafordtowncouncil.gov.uk.